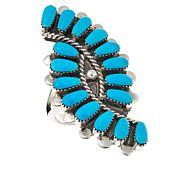 Isn't it time you invested in a great piece of turquoise jewelry? This bold, handcrafted ring is the perfect place to start. 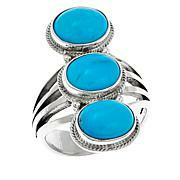 It features a stack of gorgeous Kingman turquoise stones and an elongated shape that looks great on any finger. wow!!! I love this ring...well made ,quality workmanship and comfortable ! Buy it if you can! Love my Chaco Canyon Ring. I am adding this to my collection. 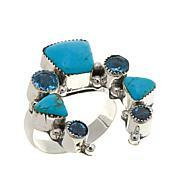 I love the workmanship of the ring its a bold statement. Thank you to the artisan for their craftmanship. I wish I could have a card of the silversmith about them and a picture to keep with the ring. Keep up the good work. This ring is such a stunner. The stones are just captivating to look at. Beautiful sky blue. This ring does get noticed and it is such a work of art. Love looking at it! Got this ring some time ago. Absolutely love this. The most extraordinary statement ring I've ever seen, yet extremely comfortable. Surprisingly clean-lined and even modern like and therefore amazing even with modern, current jewelry. 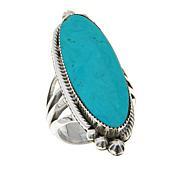 My favorite of many turquoise rings that I have. Delve into the culture and heritage of Native American peoples with handcrafted jewelry from Chaco Canyon. 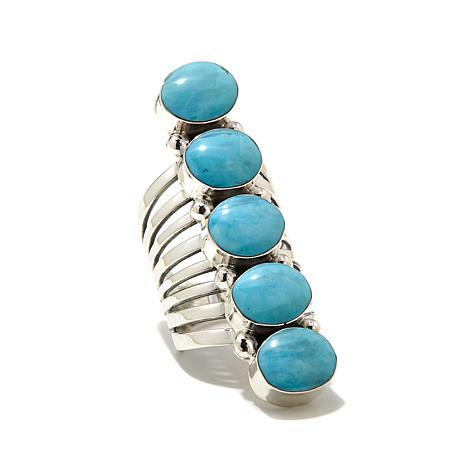 Created in the Southwest region of the United States, this emblematic collection features silver and gemstone jewelry that symbolizes the spirituality of Native American artisans and silversmiths. Remind me about Chaco Canyon Southwest Jewelry upcoming shows.